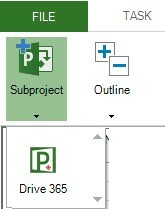 You can have more control over your project by creating smaller projects, save them in Drive 365 and then linking them into a single Project file to show where they fit in your Master Project. All subprojects need to be stored in My projects -Drive 365 cloud. When you insert a subproject, a small specific icon distinguishes it from summary tasks that are part of the master project. Click the collapsed sign next to a subproject to expand that subproject's tasks for viewing/editing. The subproject is indented at the outline level of the row where you insert it, but you can indent or outdent it just as you do with any other task. Because the subproject is represented as a summary task, you can't edit its summary information, but you can expand the outline to show the subproject's tasks and edit the project information in the master project file. Subprojects can be uploaded only from My Projects - Drive 365 cloud. 3. 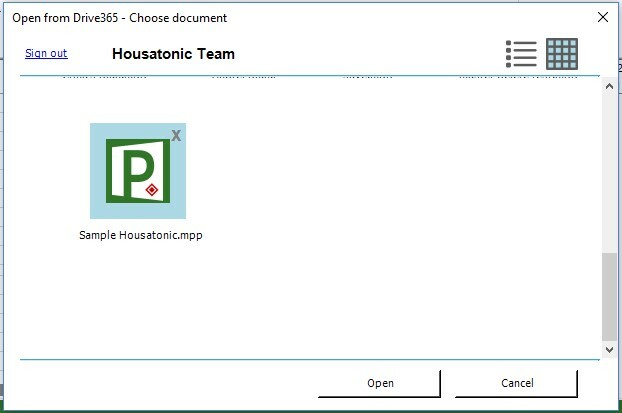 Select Projects tab, click on Subproject menu to display Drive 365. 4. Select desired plan then press Open. 5. If the inserted subproject uses other currency than the Master Project, the application will show you an alert. All subprojects will use the Master Project currency. When you save the master project, changes to the subproject are saved in the subproject's source file as well. If you want to work directly in the source file without opening the master project file, changes to the subproject's source file are updated in the master project file. In order to see the latest changes in Master Project is necessary to reopen/expand the subproject file. When you add a subproject to your Master Project, by default it will be collapsed. If you want to edit the subproject, you need first to expand the subproject summary task. Note: Any formatting changes you have applied to summary tasks or Gantt bars in a subproject does not appear in the master project. Formatting information is stored in each file and must be applied separately to the master project. After you consolidate files into a master project file, the tasks from subprojects files remain separate, resources are combined from all subprojects. You can change resource information in the master project and the changes will be replicated in the subproject's source file. You can view all resources in the master project and subprojects together in the Resource Sheet view, resource can be edited /assigned. If the same resources are used in multiple subprojects, you see the resource names just once because the resources are combined. However, it is recommended to use organization Resource Pool, then assign the resources in different subprojects. Keep in mind that if you use the same resource in multiple projects, in Master Resource Sheet will appear one resource. If that resource use different Std rate values in subproject source file, the Master Project file will calculate an average value based on std rate value and cost per use.